Events Module That Rocks! - vBulletin Mods That Rock! "Hear Alexa speak the latest posts from vbmods.rocks! Enable the Amazon Alexa skill at https://amzn.to/2uB3Hkz"
Official - Paid Events Module That Rocks! 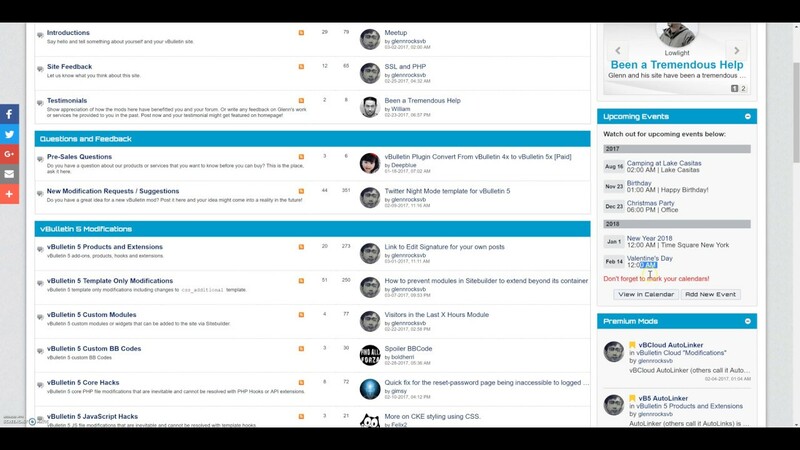 Has an "Add New Event" button that allows users to quickly create a new event to a designated forum channel. Allows you to specify a designated forum channel where new events will be posted to. Integrates with Set Editor Default Content Type mod to automatically set the default content type to Event. So it's more intuitive and requires one less click to post events. Allows you to add custom HTML content above and below the events. This mod is packaged as a module so you can easily add it to a page via drag and drop in Sitebuilder. This also doesn't require editing existing vB templates so there's nothing to worry about template merge conflicts during upgrades. This requires another mod (Set Editor Default Content Type) for the complete functionality. This must be purchased separately. Fixed missing "View Calendar" and "Add New Event" buttons when there are no upcoming events. Thanks to user "mna" for reporting this issue. Added the new Module Permissions feature to restrict viewing the module by usergroup. This is exactly the same default module feature that was recently added by vBulletin. Purchase this product add-on to get professional installation of this mod from us. Don't have a PayPal account yet or want to use a new account to purchase this mod? Sign up with PayPal now and get $5 reward! This is exactly what I am looking for actually! Just watching the video I can't think of any changes to make. Thanks for the feedback mna . The mod is now available. "How glorious a greeting the sun gives the mountains! ~ John Muir"
I have like 3 different user groups. Group 1 - not allowed to create event --- Do they also see the button? Group 2 and 3 - are allowed to create an event. But each on a different forum sub-channel. Will this work with this mod? 1. They will see the button. I can fix it by keeping it but when in the Create New Topic page, it will show an unauthorized error message. 2. You can only specify one channel per module, otherwise it wouldn't know which channel to post the event to. Thank you! I was afraid that it would be too complicated Don´t even know if they would use it... right now none of them ever used the calender or events So I thought that maybe this "call to action" could help. But don´t mind, its not really important for us. Just found this. Great mod Glenn. I have implemented the module permissions in the latest version 1.1 which I released 2 days ago. I also fixed the missing "View Calendar" and "Add New Event" buttons when there are no upcoming events. Thanks to user mna for reporting this issue. To those who've purchased this mod, please check you inbox. Just bought this module and the default editor mod, sadly i'm getting these errors below. Hope you know whats wrong here. Actually, these are just "warnings" and not "errors". Do these affect the behavior of the module? If not, then there's nothing to worry about. Even the existing vB templates have warnings too. That's why there's this setting in the root config file to turn off PHP notices in template code. And besides, these warnings seem to be not my own doing but the way vB transcodes template vB syntax into PHP code causes these warnings. Even I have a bunch of this template warning message in my server error logs and I believe it's coming from an existing vB template and not from a mod template. One of the errors only apears when i activate this module. The second error appears when i try to activate the add new event button which is not showing. So i seems to me like it has something to do with this module. Hope with this info you have an idea whats wrong. Where do you see the error messages? Can you post a screenshot? When you enabled the "Add New Event" button, did you set the "Default Forum ID for adding new event to" option? The "Add New Event" button will not show if that other option is not set because it wouldn't know which forum to add the new event to. But sorry, it seems like the add new event button is showing now. Is your forum in debug mode? Did you enable debug mode in the 2 config files? Thanks a lot, that removed the errors. All times are GMT-8. This page was generated at 08:48 AM.